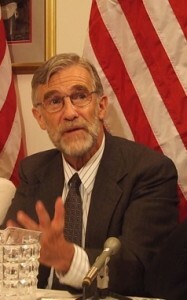 From Editor Robert Parry: Ex-CIA analyst Ray McGovern paid Consortiumnews a big compliment the other day, when he said he hoped our Web site could endure because it offers historians and citizens a solid record from which to understand what’s happened in the United States over the past 16-plus years and even longer. Ray’s point was that our unique brand of investigative journalism doesn’t just lay out the facts but includes the broader context, from the relevant history to the role of media. We also have never shied away from presenting the truth as our journalists find it. We have been willing to challenge the powers-that-be in government, business and the mainstream news media. I share Ray’s hope that this Web site can endure, but we need the help of our readers to do that. As tight-fisted as we are in our spending, we do need at least a modest budget to pay the bills, including some money for reporting and editing. Right now, we are trying to complete our spring fund drive by getting at least halfway to our goal of $25,000. Please help if you can. Ray McGovern, due to his sensitive position (retired or not) is not “free” to say whatever comes to mind…spontaneous blathering is reserved for the outsiders, namely the US citizenry at large. Ray must, “tow the line” just as though he was still at his desk at the CIA. I too worked for Uncle Sam and I can’t go around saying any damn thing I want without the usual caveats, footnotes and stated reservations. Bin Laden has been dead since Dec 2001, he could not have been killed twice. Do they really expect us to buy this crap that he was killed in April 2011? And who in their right mind would believe that out of twisted regard for respecting Islam, they would dump his body into the sea? It’s a farce. And I suppose Benazir Bhutto’s death had nothing to do with her public statement that he was dead in 2001. In any event, they think they must “Hang Together” or hang together, which is true. The whole “War On Terror” and taking away our Bill Of Rights and Constitutional protections, could not easily be moved forward and wars started unless Bin Laden was alive and at the top of the Most Wanted list. Bush did not have confidence in his ability (at this point in his history) to start the IRAQ war without having Bin Laden alive. Keep in mind, he also tried to create a link between Bin Laden and Iraq, so that was on his mind. We are so lucky to have Consortium news and hopefully readers are spreading its valuable contents far and wide.